Trash your grip. Make a run. Prevent all damage during this run. 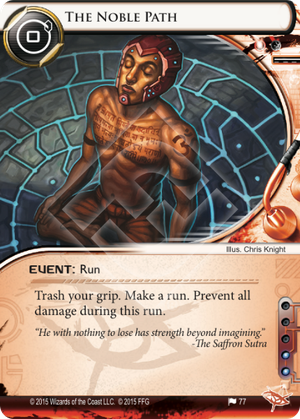 Can the Runner play The Noble Path if it is the only card in their grip? Yes. There is no stipulation on the card that requires at least one card to be trashed. Does The Noble Path prevent the damage dealt by Dedicated Response Team? No. Dedicated Response Team triggers when the run ends, so ability on The Noble Path has already ended by the time the damage is dealt. Does The Noble Path prevent the damage dealt by Checkpoint? Yes. Checkpoint triggers when the run is declared successful at step 4.4, which is still part of the run. Does The Noble Path prevent damage from both Runner and Corp card abilities? Yes, even damage suffered from Runner abilities like Spinal Modem is prevented. Could be paired well with something like Sports Hopper for protection if there's a server that you know you can run through because it's only protected by things like Komainu, Chetana, Neural Katana. The reason you'd want something like Sports Hopper is in case they rez something like Dedicated Response Team which does damage to you AFTER the run ends and AFTER the effect of TNP is over. Of course you might have a Plascrete Carapace. Note the interaction with Bug Out Bag. By having a Bug Out Bag installed you can make a run, prevent all damage during the run and then draw back up at the end of your turn. With a >5 Bug Out Bag you can even circumvent the normal hand limit (end of turn is after discard phase). Conceivably you could use this with Severnius Stim Implant and a 20 (+ breaker costs) credits to make a super glorious 10 card dig: set up Severnius Stim Implant (2) set up a Bug Out Bag with 18, make a Noble Path run to empty your hand (stealing an Obokata Protocol is optional but encouraged), end of turn your Bug Out Bag fires to give you 18 cards, next turn run with Severnius, trashing your entire hand. If you can score the access you get to see 9 additional cards for a whopping total of about a quarter of the corp's deck. Then, if you have my luck you'll steal a 3/1 agenda and get Sea Scorched into oblivion.